The F-35 is not a dogfighter. In future most air-combats interceptions will be fought “beyond the visible horizon” (BVR). 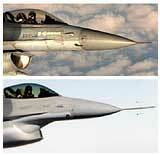 Thus, fewer of the older close “dogfights” style operations will occur. The design challenge of JSF is to find a way to develop a family of airplanes and attain economies of commonality and scale that drive down the costs of each airplane. The objective is to make the airplanes for about half of what today's airplanes cost. The F-35 is designed to accommodate growth in both mission and technology. Possible future versions of the aircraft include an electronic-attack variant, an uninhabited version, and an F-35 that incorporates a laser weapon. The main advantages of the F-35 over the F-22 are that it carry a larger internal payload (2x 1,000 lbs vs 2x 2,000 lbs for F-35), and that it is far less expensive. But the F-35 does not have supercruise, it does not have thrust-vectoring, and it is not as stealthy as the F-22. 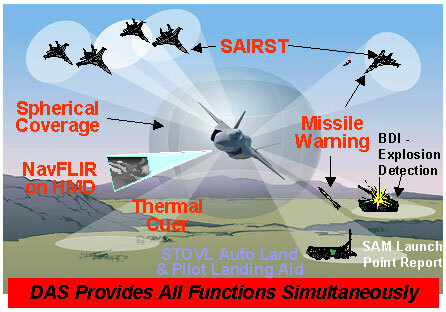 A number of the systems for JSF are taken right out of the F-22, then modified and improved. These modifications and improvements will eventually come back and upgrade the F-22. The contractors did not invest a lot of money to develop new systems, but rather put the new technologies of stealth and the integrated avionics that are in F/A-22, into the JSF. On 27 June 2002, the F-35 program achieved its first major technical milestone, on schedule and under budget, when engineers finalized the external lines of the aircraft. The resulting "lines freeze" configuration is nearly indistinguishable from that of the X-35 JSF demonstrators that underwent flight testing in 2000 and 2001. Design changes, though small, will bring overall performance gains to the stealthy fighter. The design had been evolving incrementally since the configuration that flew as the X-35 demonstrator. Finalized changes included extending the forward fuselage by five inches to better accommodate avionics and sensors, and moving the horizontal tail rearward by two inches to maintain stability-and-control with the newly extended forward fuselage. The freeze raising by about one inch the top surface of the aircraft along the centerline, thus increasing fuel capacity by 300 pounds and extending range. It added slightly more twist to the wing camber on the CV variant to improve both handling qualities and transonic performance, and slightly adjusting the positioning of the vertical tails to improve aerodynamic performance. Earlier in the design phase, engineers also reduced the length of the engine's inlet ducts, thereby saving weight and improving performance. The Strategy Integration team supports the Joint Strike Fighter Program Office with long-range planning for major capability upgrades such as Block 4 and beyond. While Block 4 is targeted for possible authorization in the 2009-2010 period, these plans typically look into the future 10 to 20 years. This is driven by the long acquisition process associated with the planning, budgeting, contracting, development and production/retrofit incorporation of a given upgrade. Lockheed Martin and its partners Northrop Grumman and BAE SYSTEMS are also assessing F-35 derivative concepts such as a two-seat variant and an electronic- attack variant. This long-term planning is focused on making certain the F-35 is always the system of choice to satisfy customers' changing needs. An integrated airframe design, advanced materials and an axisymmetric nozzle maximize the F-35's stealth features. A quick look at the aircraft reveals an adherence to fundamental shaping principles of a stealthy design. The leading and trailing edges of the wing and tail have identical sweep angles (a design technique called planform alignment). The fuselage and canopy have sloping sides. The canopy seam and bay doors are sawtoothed. The vertical tails are canted. The engine face is deeply hidden by a serpentine inlet duct. The inlet itself has no boundary layer diverter channel, the space between the duct and the fuselage, to reflect radar energy. And, of course, weapons can be carried internally. Each internal bay contains two hardpoints onto which a wide variety of bombs and missiles can be attached. According to November 2005 reports, the US Air Force states that the F-22 has the lowest RCS of any manned aircraft in the USAF inventory, with a frontal RCS of 0.0001~0.0002 m2, marble sized in frontal aspect. According to these reports, the F-35 is said to have an RCS equal to a metal golf ball, about 0.0015m2, which is about 5 to 10 times greater than the minimal frontal RCS of F/A-22. The F-35 has a lower RCS than the F-117 and is comparable to the B-2, which was half that of the older F-117. Other reports claim that the F-35 is said to have an smaller RCS headon than the F-22, but from all other angles the F-35 RCS is greater. By comparison, the RCS of the Mig-29 is about 5m2. Much has been improved between the design of the F-22 and the F-35. The F-35 doors for landing gear and equipment, as well as control surface, all have straight lines. The F-35 does not require "saw tooth" openings to divert RF energy. One reason the openings on the F-35 are straight lines is reported to be embedded electrical wires near the edges whcih interfer with RF signals. The F-35 RAM is thicker, more durable, less expensive and, being manufactured to tighter tolerances compared to that of the F-22. The tighter tolerances means less radar signal can penetrate openings and reflect back to its source. The newer RAM is more effective against lower frequency radars, and maintenance should cost about a tenth that of the F-22 or B-2. Some forms of RAM have have electrical plates or layers within the layers of carbon composits. Northrop Grumman Electronic Systems is developing the Multi-Mission Active Electronically Scanned Array (AESA) Radar for the F-35. This advanced multi-function radar has gone through extensive flight demonstrations during the Concept Demonstration Phase (CDP). The radar will enable the F-35 JSF pilot to effectively engage air and ground targets at long range, while also providing outstanding situational awareness for enhanced survivability. In a joint effort with Lockheed Martin Missiles and Fire Control, Northrop Grumman Electronic Systems will provide key electronic sensors for the F-35, which includes spearheading the work on the Electro-Optical Distributed Aperture System (DAS). This system will provide pilots with a unique protective sphere around the aircraft for enhanced situational awareness, missile warning, aircraft warning, day/night pilot vision, and fire control capability. Designated the AN/AAQ-37, and comprising six electro-optical sensors, the full EO DAS will enhance the F-35's survivability and operational effectiveness by warning the pilot of incoming aircraft and missile threats, providing day/night vision and supporting the navigation function of the F-35's forward-looking infrared sensor. Lockheed Martin Missiles and Fire Control and Northrop Grumman Electronic Systems are jointly providing key electronic sensors for the F-35 to include the Electro-Optical Targeting System (EOTS). The internally mounted EOTS will provide extended range detection and precision targeting against ground targets, plus long range detection of air-to-air threats. 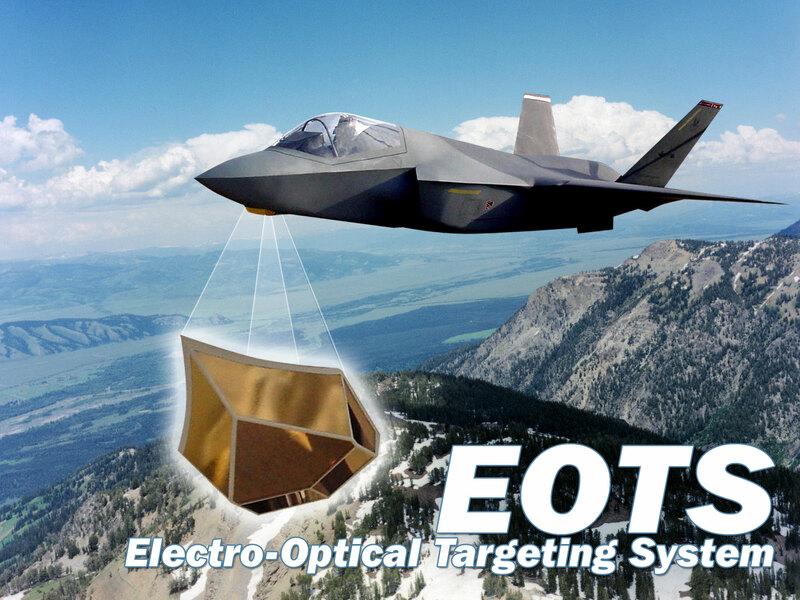 The Electro-Optical Targeting System is an affordable, high-performance, lightweight, multi-functional system for precision air-to-air and air-to-surface targeting. The low-drag, stealthy EOTS is integrated into the Joint Strike Fighter's fuselage with a durable sapphire window and is linked to the aircraft's integrated central computer through a high-speed fiber-optic interface. The EOTS uses a staring midwave 3rd generation FLIR that provides superior target detection and identification at greatly increased standoff ranges. EOTS also provides high-resolution imagery, automatic tracking, infrared-search-and-track, laser designation and rangefinding, and laser spot tracking. Sharing a Sniper legacy, it provides high reliability and efficient two-level maintenance. Lockheed Martin Missiles and Fire Control is teamed with Northrop Grumman Electronic Systems to produce the JSFTM Electro-Optical Sensor System (EOSS). The EOSS consists of the EOTS, led by Lockheed Martin with BAE SYSTEMS, and the Distributed Aperture System, which provides 360-degree situational awareness, led by Northrop Grumman. A cornerstone of future defense capability for the U.S. and its allies, the EOSS supports situational awareness, target recognition, and precision weapon delivery. Unlike the cockpit design of current-generation fighter aircraft, the F-35's does not include a head-up display. Rather, the information normally visible on such a display is instead projected on the pilot's helmet visor. Vision Systems International, LLC (VSI) is developing the most advanced and capable Helmet Mounted Display System (HMDS) for the F-35. 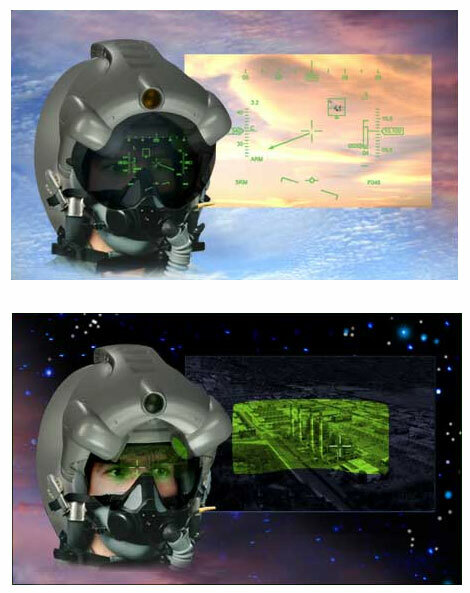 Utilizing extensive design experience gained on successful production Helmet Mounted Displays (HMD), the F-35 HMDS will replace the traditional Head-Up-Display (HUD) while offering true sensor fusion. Northrop Grumman Space Technology's integrated avionics satisfy the requirements for greatly increased functionalities within extreme space and weight limitations via modular hardware that could be dynamically programmed to reconfigure for multiple functions. This "smart"-box approach delivers increased performance, quicker deployment, higher availability, enhanced scalability and lower life cycle costs. The F-35 will have the most robust communications suite of any fighter aircraft built to date. The F-35 will be the first fighter to possess a satellite communications capability that integrates beyond line of sight communications throughout the spectrum of missions it is tasked to perform. The F-35 will contain the most modern tactical datalinks which will provide the sharing of data among its flight members as well as other airborne, surface and ground-based platforms required to perform assigned missions. The commitment of JSF partner nations to common communications capabilities and web-enabled logistics support will enable a new level of coalition interoperability. These capabilities allow the F-35 to lead the defense community in the migration to the net-centric warfighting force of the future. 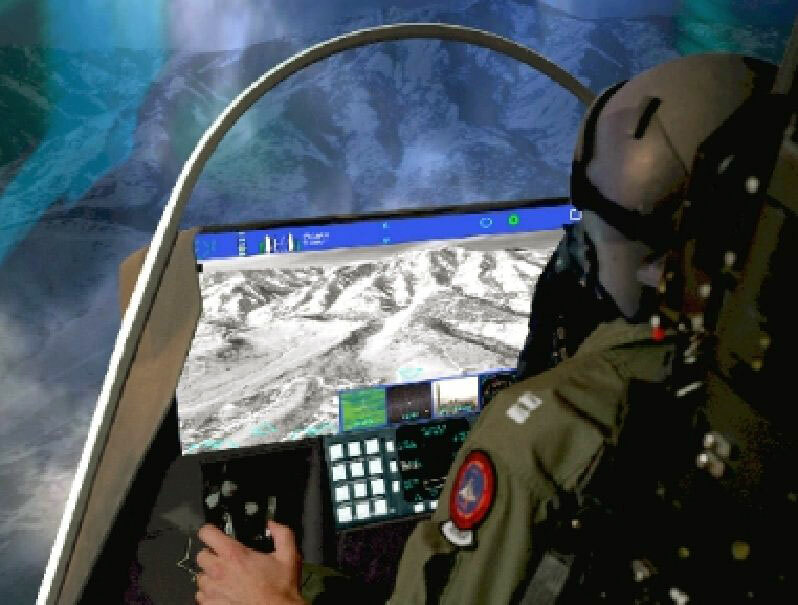 Rockwell Collins's 8"x20" Multi-Function Display System (MFDS) will be the panoramic projection display for the F-35. MFDS employs leading edge technology in projection engine architecture, video, compression, illumination module controls and processing memory – all of which will make the MFDS the most advanced tactical display. One-gigabyte-per-second data interfaces will enable the MFDS to display six full motion images simultaneously. The adaptable layout will be easily reconfigurable for different missions or mission segments. Projection display technology will provide a high-luminance, high-contrast, and high-resolution picture with no viewing angle effect. The cockpit features a large eight-inch by 20-inch color display, providing tactical information as well as aircraft system data. A next-generation voice-command system allows the pilot to manage systems without manual input. Tasks such as changing radio channels are accomplished simply by speaking a command. The pilot also has the option to manipulate the displays by touching the screen or by using a yoke-mounted cursor. F-16 pilots, themselves accustomed to a superb pilot-vehicle interface, drop their jaws when they see the JSF's cockpit. It is completely night-vision capable. It offers exceptional lookdown angle over the canopy rail and an excellent field of view over the aircraft's nose. The F-35 provides its pilot with unsurpassed situational awareness, positive target identification and precision strike under any weather condition. Mission systems integration and outstanding over-the-nose visibility features are designed to dramatically enhance pilot performance. The F-35 will employ a variety of US and allied weapons. From JDAMs to Sidewinders to the UK Storm Shadow, the F-35 has been designed to carry either internally or externally a large array of weapons. Seven external stations provide an assortment of air-to-air and air-to-ground weapons including the full range of "smart" munitions. These external stations include one centerline hardpoint, and outer hardpoints for air-to-air missiles. Two internal weapons bays are each capable of carrying (1) 2000lb class weapon and (1) AMRAAM per bay. The F-35 weapons bay accommodates a variety of internally carried ordnance that ground crews can easily load. The weapons include air-to-air missiles such as the AIM-120 and AIM-132 air-to-air missiles, and "smart," GPS-guided munitions such as 1000-lb., and 2000-lb., versions of the joint direct attack munitions. The missles are mounted directly on the inside of the weapons bay door. When the door opens the AMRAAM enters in the airstream. While this works for the AMRAAM, most versions of the Sidewinder need to have the missle in the airstreme before lock. The F-22 provides for this with an ejection system for the missile, but the F-35 doesnt have this, and this may create problems qualifying the AIM-9X to fire from inside the bay. Most air-to-surface weapons are in the 2,000 lb (910 kg) class, however, but these weapons are usually around 12.5 to 14 ft (3.80 to 4.25 m) long and too large to fit within the F-22. Bearing these limitations in mind, JSF designers purposefully sized the two internal bays around these larger 2,000 lb class weapons. The two weapons that have predominantly dictated the overall length and depth of the bays are the AGM-154 JSOW and the GBU-31 2,000 lb (910 kg) version of JDAM. The larger internal weapons bay configuration was a result of the natural frame vault height proportions generated to get a 2,000lb munition inside the airframe. Other items like the JSOW and other "14 footer" (LGB GCS) class munitions were a secondary capability outcome derived from the geometry of the deeper (25" vice 18") carriage box. The internal bays of the F-35B STOVL variant were redesigned in late 2004 and are now shorter and reduced in width, compared to the F-35A CTOL model. This was done to reduce the weight of the F-35B to meet other more important performance goals. As a result, the F-35B is no longer compatible with JSOW and 2,000-lb JDAM weapons. The largest weapon this F-35 variant can carry internally is the GBU-32 1,000-lb version of JDAM. Continuous tailhook-to-nose-gear structure and catapult-compatible nose gear launch system are strengthened for catapult and arresting loads. Engineers are exploiting the relationship between designing and manufacturing to further reduce cost. The aircraft's wingbox, for example, carries through the fuselage and integrates the wing and fuselage into one piece. By eliminating the side-of-body joint between these traditionally independent components, the design reduces much of the structure, weight and assembly typically associated with this interface. The F-35's diverterless inlet lightens the overall weight of the aircraft. Tactical aircraft pose a formidable challenge for inlet designers. A fighter inlet must provide an engine with high-quality airflow over a wide range of speeds, altitudes, and maneuvering conditions while accommodating the full range of engine airflow from idle to maximum military or afterburning power. Historically, inlet complexity is a function of top speed for fighter aircraft. Higher Mach numbers require more sophisticated devices for compressing supersonic airflow to slow it down to subsonic levels before it reaches the face of the engine. Inlet designs for fighter aircraft must also account for the boundary layer of low-energy air that forms on the surface of the fuselage at subsonic and supersonic speeds. The on the Joint Strike Fighter performs miracles that only aeronautical engineers can fully appreciate. At high aircraft speeds through supersonic, the fuselage bumps at each inlet work with forward-swept inlet cowls to redirect unwanted boundary layer airflow away from the inlets, essentially doing the job of heavier, more complex, and more costly approaches used by current fighters. The diverterless inlet eliminates all moving parts. Because logistics support accounts for two-thirds of an aircraft's life cycle cost, the F-35 will achieve unprecedented levels of reliability and maintainability, combined with a highly responsive support and training system linked with the latest in information technology. The aircraft will be ready to fight anytime and anyplace. Autonomic Logistics (AL) is a seamless, embedded solution that integrates current performance, operational parameters, current configuration, scheduled upgrades and maintenance, component history, predictive diagnostics (prognostics) and health management, and service support for the F-35. Essentially, AL does invaluable and efficient behind-the-scenes monitoring, maintenance and prognostics to support the aircraft and ensure its continued good health. The F-35 is designed to reduce operational and support costs significantly by increasing reliability and reducing required maintenance. Such high reliability will enable rapid deployment with minimum support equipment. The cost to operate and maintain the F-35 is expected to be 50 percent less than that for the aircraft it is designed to replace. For decades, the concept of repairing new aircraft came only after the aircraft was built. Then, it had to conform to an existing logistics structure. But the F-35's logistics system has to be up and running before the first aircraft is flown. The autonomic logistics system, as the F-35 system is called, will monitor the health of the aircraft systems in flight; downlink that information to the ground; and trigger personnel, equipment, and parts to be pre-positioned for quick turnaround of the aircraft. Ultimately, this automated approach will result in higher sortie-generation rates. Autonomic logistics is also something of a mind reader. Through a system called prognostics and health management, computers use accumulated data to keep track of when a part is predicted to fail. With this aid, maintainers can fix or replace a part before it fails and keep the aircraft ready to fly. Like the rest of the program, the autonomic logistics system is on a fast track. It has to be available to support the air vehicle during operational test and evaluation.